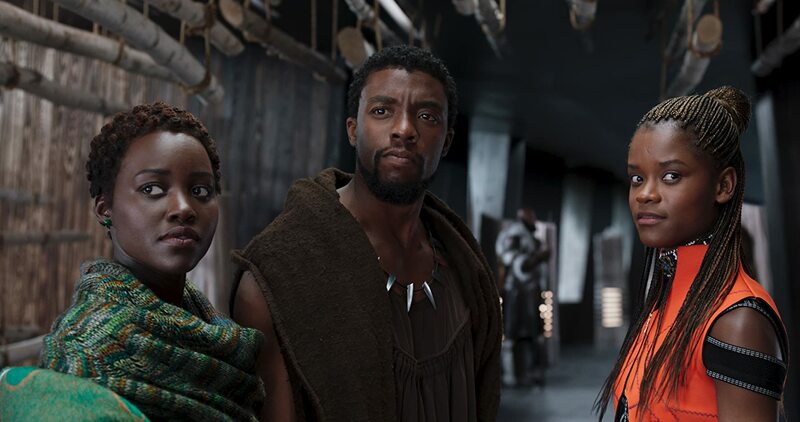 * First, I’m a little late to this party; my wife and I only saw “Black Panther” last weekend. The opening weekend of the movie we were having a blast in Los Angeles at the Gallifrey One Doctor Who convention , so … sorry-not-sorry (hehe). * I used to read Marvel comics as a kid (the big soft-back editions of “Hulk” “SpiderMan” and “Fantastic Four” were great stuff! ), but I haven’t been a steady reader of them since I was a kid in the 1970s, save for a special one-off book every now and then. So I’m not really up on the multiple realities/universes/mythologies as other fans who’ve been living/breathing the Marvel books for far longer than I. I also used to love “The Incredible Hulk” TV series as a kid, but those had very little to do with the comic books. My Marvel fandom level these days is more ‘fond-remembrance-from-childhood’ than current rabid fan of all-things-Marvel. Yes, I’ve seen all of the movies (though not the Netflix shows) and I did meet Stan Lee once (albeit quickly; it was a long line). So if I accidentally skewer any Marvel sacred cows? I apologize in advance. That said? “Black Panther” was, for me, a welcome refresh. The story opens with a flashback in late 1980s Oakland, California, with a secret envoy from Wakanda and a mysterious assassination. 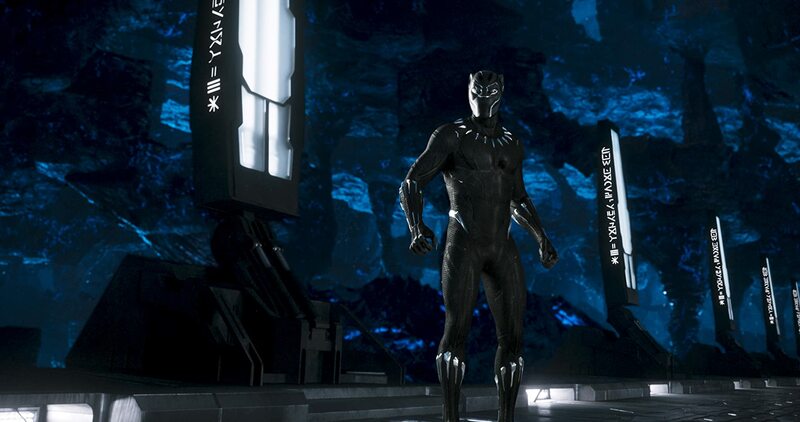 It then cuts to the present where we see young new king T’Challa (Chadwick Boseman) in his fictional African nation of Wakanda; a Tomorrowland-style utopia masquerading (literally under a massive forcefield-cloak) as a third-world nation so that its superior technology (based on the subterranean wealth of a giant “vibranium” meteorite beneath its surface) won’t be exploited by a world that is not yet ready for it. T’Challa finds his claim to the throne threatened by various challengers, and he must take face them in personal combat to keep his throne. 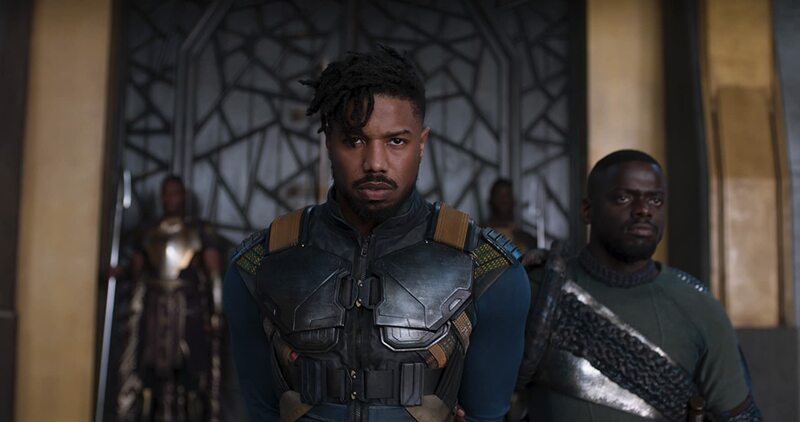 Returning from a dangerous mission in South Korea (and the first test of his new “Black Panther” suit), T’Challa finds his latest challenger is an American named Erik Kilmonger (a standout Michael B. Jordan of “Creed”); who hails from the streets of Oakland. Kilmonger, it turns out, is a legitimate heir to the throne; his slain father was T’Challa’s uncle, and (in a Shakespearean twist) was killed by his own brother, T’Challa’s late father. Kilmonger soon defeats T’Challa in combat, and assumes the Wakanda throne. Kilmonger plans to use his new nation’s high technology to make Wakanda the world power he feels its should be; he also plans to aid African revolutionaries all around the world. The presumed dead (but still living) T’Challa still has allies on the inside, chiefly his sister Shuri (Letitia Wright) who runs/maintains the country’s technology. There is also T’Challa’s love interest; warrior Nakia (Star Wars’ Lupita Nyong’o), and one of his bodyguard/generals Okoye (“Walking Dead” force of nature Danai Gurira; one of the few things I still miss about that show). T’Challa’s supporters, along with bewildered out-of-his-element American CIA agent Everett Ross (“Sherlock”’s Martin Freeman), attempt to rally a nearby rival tribe in an effort to overthrow the dangerous Kilmonger. Kilmonger is ultimately defeated, but not before T’Challa recognizes that there was some truth to what Kilmonger wanted; to share Wakanda’s technological wealth with the disadvantaged around the world, but in a limited capacity and without strings attached. Those are but the broadest broad-strokes of the story, as there are many subplots, supporting characters (Daniel Kaluuya’s “W’Kabi”, Forest Whitaker’s “Zuri“, Angela Bassett’s “Ramonda”), and perhaps most importantly, deep political commentaries and subtexts throughout the film that give it a resonance lacking in many of the other Marvel movies to date. The politics of this movie are getting a lot of press recently, and perhaps deservedly so. We’re living in an age of increasingly high cultural/racial xenophobia, increasing nationalism, isolationism, and even an openly hostile attitude towards certain African countries (aka “shitholes”) by a certain American President-Who-Shall-Remain-Nameless. “Black Panther” is, for all of its action movie trappings, very much a political movie at its heart. Messages, both subtle and obvious, are everywhere in this film. We live in politically divisive times, and our pop culture is bound to reflect that. There is a terrific quote near the end of the movie, as T’Challa addresses the United Nations to offer limited Wakandan aid to the world, “In times of crisis, wise men build bridges as fools build barriers.” This quote rang in my head for days afterward, as it echoes a similar sentiment made last year by Pope Francis, and it is also a nicely needed slap in the face to the aforementioned PWSRN who pushes for a big, useless border wall in his many rhetorical speeches. “Black Panther” is a pop cultural bridge rather than a barrier. This is also a very good time for a movie that both reaffirms and celebrates a rich amalgam of various African cultures; albeit from the perspective of a fictional African paradise. It’s also of note that the film is made by a young, celebrated African-American director Ryan Coogler (“Creed”), who uses a production team largely composed of women; cinematographer Rachel Morrison, production designer Hannah Beachler, editor Debbie Sherman and costumer Ruth Carter. ^ Letitia Wright’s “Shuri”; arguably the most important character of the film, both literally and symbolically. Equally refreshing to see was the character of T’Challa’s sister Shuri (Letitia Wright); a young, confident African woman who is in charge of Wakanda’s high technology, taking over the “Q”-type role typically seen in James Bond movies. In addition to maintaining much of the nation’s tech, she creates the hero’s Black Panther’s suit, as well as cool gizmos that come in handy. The suit itself has one very unique feature; it absorbs all impact energy directed at it, stores that energy, and then redirects it onto an attacker (or attackers) as a massive shock wave. The suit’s capacitance redirection could be seen as a metaphor for the recent protest movements that have erupted into being when people have had enough. The suit takes it, and takes it… and then gives it back. Ten-fold. It’s also worth noting that no one seems to be Shuri’s intellectual superior in Wakanda, and yet she is still a young woman. A more positive message I can’t imagine for those young women who will be this world’s future engineers, scientists, teachers and astronauts. 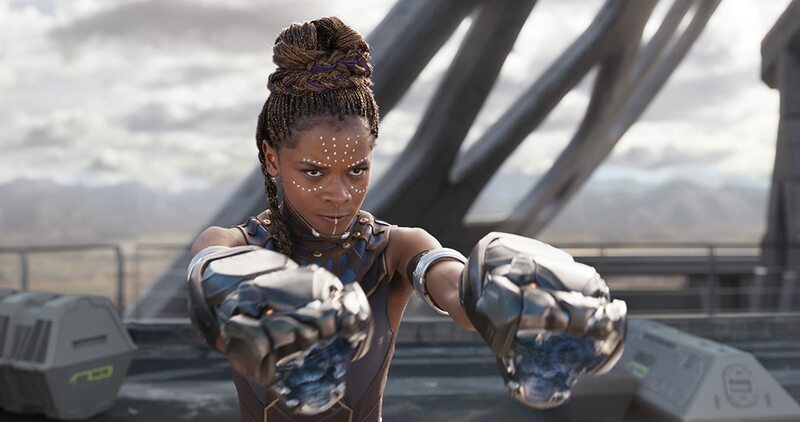 Though Shuri is (technically) a supporting character, she may in fact, be the film’s most important character; as she both creates and operates the high technology that is the hope Wakanda offers to our own screwed-up world. 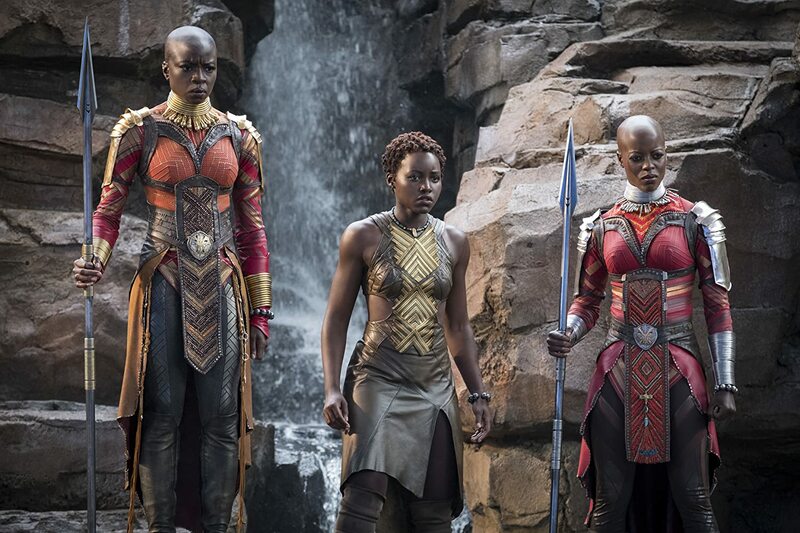 I also enjoyed seeing badass warrior/general Okoye (Danai Gurira); who loathes covering her beautiful bald head with a wig while on assignment in South Korea. Gurira brings a nice combination of her patented, Michonne-style toughness tempered with a deep, internalized conflict as she is forced to betray the current occupant of the Wakanda throne (to whom she is pledged to serve) and do what she knows is right. 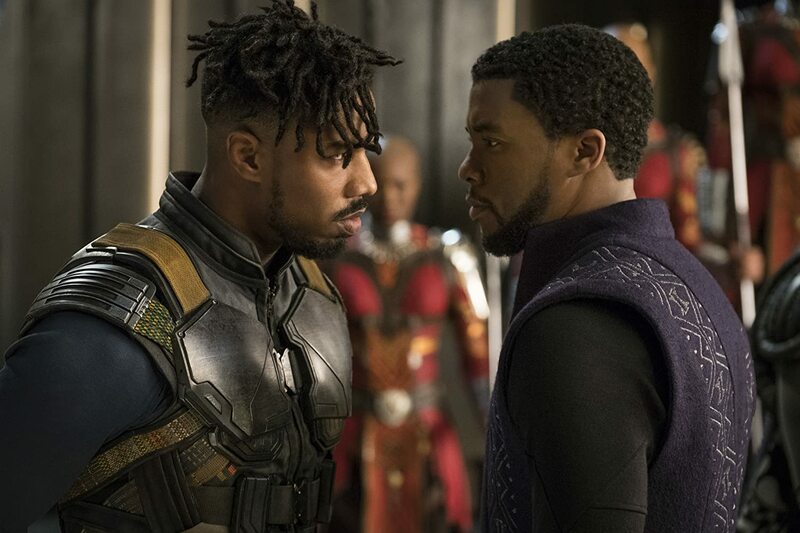 Another element of this movie that felt fresh was a so-called ‘villain’ who has a legitimate grievance; Michael B. Jordan’s Eric Kilmonger isn’t some mutant monster who wants to change the rest of us into monsters, or a hapless, lab coat-wearing nerd who is turned into a motivation-less abomination. He is an angry young man who learns that his birthright was stolen from him. It also helps that Michael B. Jordan delivers a charismatic-as-hell performance. Yes, Kilmonger’s means are wrong, and he brings a lot of ‘ugly American’ attitude to Wakanda, but there is a deep undercurrent of righteousness to his anger, despite his brutality. He has as much right to the throne as T’Challa, and the movie doesn’t shy away from this fact. After Kilmonger is mortally wounded in the climactic combat for the throne, T’Challa allows him to see a beautiful sunset over the breadth of Wakanda. 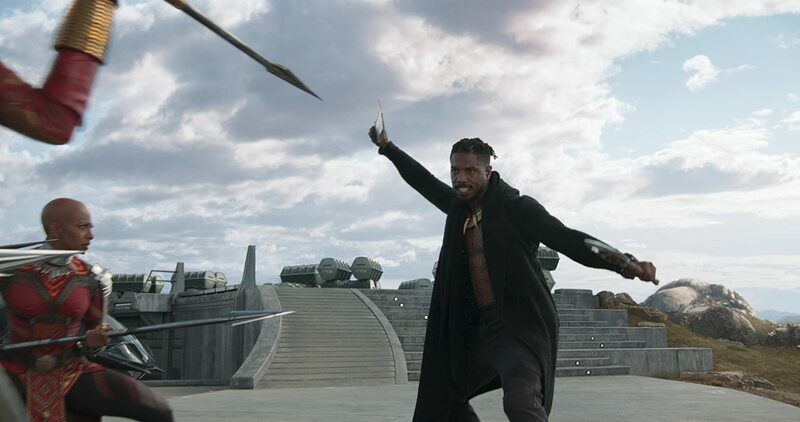 T’Challa then offers him a chance to remain alive (using Wakanda’s advanced medical technology) as a prisoner, but Kilmonger refuses, citing a sentiment of African American slaves; many of whom preferred to die at sea rather than arrive at America in chains. Even the ending of the film is something of a compromise between T’Challa’s and Kilmonger’s ideologies. 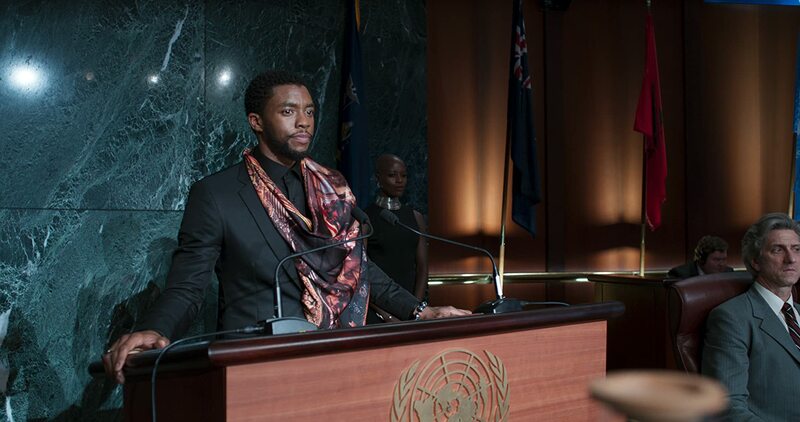 T’Challa does reveal Wakanda’s true nature to the United Nations, but in the form of positive outreach and not hostile conquest. His first ‘mission’ takes place in urban Oakland, California… where Eric Kilmonger was raised. Able support in both heroism and villainy comes from two welcome sources. The villainy support comes from the king of motion capture-acting Andy Serkis (out of CGI makeup, save for one bionic arm) as South African arms dealer/mercenary Klau. The heroic support comes from “Sherlock” favorite (and Serkis’ “Hobbit” costar) Martin Freeman as CIA agent Everett Ross. Freeman is pretty much the sole reason I went to see the first “Hobbit” movie back in 2012 (I’m not a fan of Middle Earth; more of a sci-fi guy… sorry). The two characters are an interesting study in contrasts, as Serkis does a rowdy South African accent, and Freeman does a very subdued American one. Both add a bit of fun to the film in their supporting roles. Another nit is a bit more central. T’Challa/Black Panther is well-acted by Chadwick Boseman, but as a character he feels a bit underwritten at times. He’s stoic and he’s noble (and even a bit naive), but in comparison to the more colorful villains and supporting characters? He’s in danger of being acted off of the screen. That’s no fault of the actor’s, it’s just that he’s sharing the screen with a supporting cast of actors/characters who have tremendous charisma and magnetism. Even his love scenes with Nakia (Lupita Nyong’o) seem a teensy bit humdrum at times. This is an minor Achilles’ heel of quite a few superhero movies, such as 2008’s “The Dark Knight” (Heath Ledger’s magnificent “Joker”) or 2010’s “Thor” (with Tom Hiddleston’s wild “Loki”). Going further back, we also have 1989’s “Batman” (Jack Nicholson’s “Joker”) or even 1978’s “Superman” (with Gene Hackman’s “Lex Luthor”). All of these films, including “Black Panther” had perfectly solid and interesting lead characters; but their villains (and even supporting casts) were sometimes equally, if not a bit more interesting. 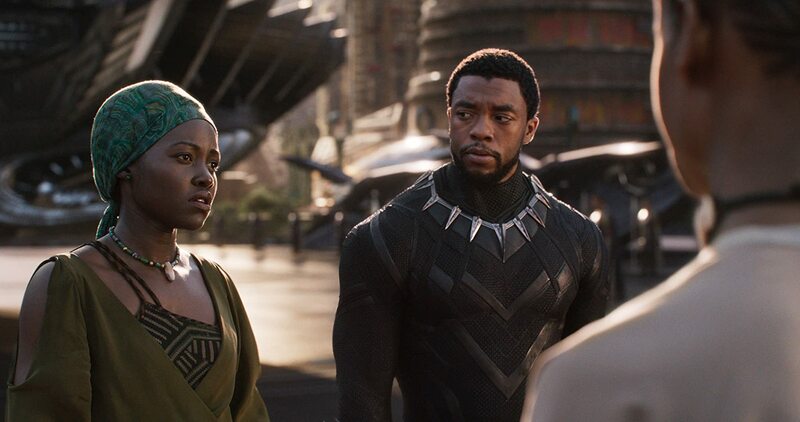 While many of the Marvel movies to date have been relatively lightweight entertainment (with a few notable exceptions), “Black Panther” has a lot more on its mind than other movies of the Marvel brand. It reminds me a bit of DC’s “Wonder Woman”; which also had a protagonist hailing from a mysterious, secretive and arguably superior culture. Both films are very politically charged, but also inspirational. To see the affects that they are having on diverse audiences of all kinds (as well as their tremendous box office appeal) is an affirmation that the modern moviegoing audience is hungry for more representation; and that’s a reality seems to be finally dawning on the industry. Representation matters, and it always will. “Black Panther” and “Wonder Woman” also prove that such entertainment needn’t be heavy-handed or overly stoic; they can also be sleek, slyly subversive and exciting. More superhero movies like “Black Panther” might just permanently snap me out of my Marvel sugar coma.